Empty gelatin capsules are a useful product to have when doing any sort of fitness regimen or diet. They can make the process of using supplements or other herbs used to get fit much cheaper and easy to get down. Using already packaged supplements can turn out to be quite expensive but using empty gelatin caps with a bag of the supplement you are using in bulk can save you a ton of money. They even make a machine that will put together the supplement capsules for you so you do not have to take the time out of your day to do it. As for alternative herbs that some may use to get healthy, they can taste bitter or unpleasant going down. By using empty gelatin capsules you can easily get down the herbs and get on with your day without any gagging or sour faces. Find out where to buy empty gelatin capsules and you could use these tools to your advantage. Some may have questions though such as: where to buy empty gelatin capsules or maybe what kind of variety the capsules come in. The gel capsules come in a wide variety of sizes and interesting flavors for people looking to go beyond boring tasteless caps. The caps come in a wide variety of fruity, meaty, and other fun flavors for you to try out and experiment with to make your health routine as easy as possible. Looking to take lots of different supplements but do not have the time to individually capsule every one every day? There are dozens of sizes of capsules for whatever you may be wanting to do, even extra large capsules for those wanting to take many different types of supplements at once. 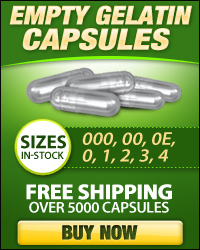 These variety of capsules also save you money and time. Wondering where to buy these empty gelatin capsules for your healthy lifestyle routine? Well they sell basic ones in any health food store but you won’t find much variety there. Some online providers can sell and ship you all sorts of different capsules. Some even sell variety packs so you can try capsules and figure out which one will suit your needs the best.